Gallium Nitride (GaN): Physics, Devices, and Technology offers a balanced perspective on the state of the art in gallium nitride technology. A semiconductor commonly used in bright light-emitting diodes, GaN can serve as a great alternative to existing devices used in microelectronics. It has a wide band gap and high electron mobility that gives it special properties for applications in optoelectronic, high-power, and high-frequency devices, and because of its high off-state breakdown strength combined with excellent on-state channel conductivity, GaN is an ideal candidate for switching power transistors. Written by a panel of academic and industry experts from around the globe, this book reviews the advantages of GaN-based material systems suitable for high-frequency, high-power applications. It provides an overview of the semiconductor environment, outlines the fundamental device physics of GaN, and describes GaN materials and device structures that are needed for the next stage of microelectronics and optoelectronics. The book details the development of radio frequency (RF) semiconductor devices and circuits, considers the current challenges that the industry now faces, and examines future trends. 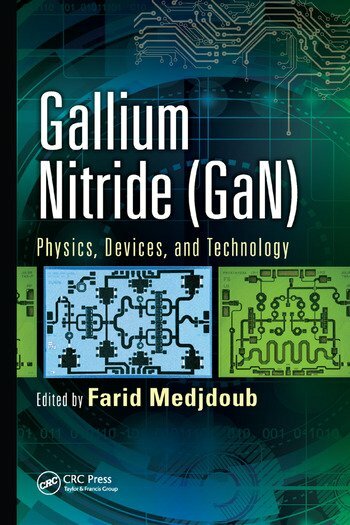 A single-source reference for students and professionals, Gallium Nitride (GaN): Physics, Devices, and Technology provides an overall assessment of the semiconductor environment, discusses the potential use of GaN-based technology for RF semiconductor devices, and highlights the current and emerging applications of GaN. Farid Medjdoub is a CNRS senior scientist at IEMN in France. He earned his Ph.D in electrical engineering from the University of Lille in 2004, and worked as a research associate at the University of Ulm in Germany before joining IMEC. Medjdoub’s research interests include the design, fabrication, and characterization of innovative GaN-based devices. He is the author and co-author of more than 100 articles, and holds several patents deriving from his research. In addition, he serves as a reviewer for IEEE journals, is a TPC member in several conferences, and is part of the French observatory of wide-bandgap devices. Krzysztof (Kris) Iniewski manages R&D at Redlen Technologies, Inc., Vancouver, Canada. He is also the president of CMOS Emerging Technologies Research, Inc. (www.cmosetr.com). Iniewski has held numerous faculty and management positions at the University of Toronto, University of Alberta, SFU, and PMC-Sierra, Inc. He has written and edited several books for numerous publications including CRC Press, published more than 100 articles in international journals and conferences, and holds numerous international patents. He is also a frequent invited speaker and has consulted for multiple organizations internationally. His personal goal is to contribute to healthy living and sustainability through innovative engineering solutions.